Congratulations to "Katherine G.", the winner in Maggie's giveaway. Thank you to all who participated! Rough Waters began with a character and stolen treasure. For this third book in my Mossy Bog series, I started with a character that had appeared briefly in earlier books, Jeanie Munro. After her husband ran off with another woman, leaving her with two kids and a crapload of debt, Jeanie painfully reinvented herself as a florist with pink hair. That was my backstory. To craft Jeanie’s story and happily ever after, I knew she had to be pushed to the near breaking point again. Her family’s safety, their home, and her business are breached. Her choices are to crack under pressure again and let her friends and family make decisions for her, to retreat into the pre-divorce world she’d once known with the man who abandoned her before, or to go on the offense and neutralize the threat. Former SEAL Rock Mackenzie believed his luck changed when he and his business partner found gold sovereigns after reading the journal he inherited upon his mother’s recent death. But his boat exploded, his buddy died, and Rock nearly lost his life. When he healed up enough to leave the hospital, his coins were long gone. His only lead is the guy who used to work at the marina and who also temped for Rock’s lawn service. Rock came home once to find this guy’s nose pressed against his window. The guy’s in the wind, but his ex-wife is Rock’s best hope for recovering his stolen property and paying off his investor. Without the coins, he must relinquish the journal, written by the only survivor of an off-the-books shipwreck, and forfeit all rights of salvage from the wreck. The story opens with Rock in Mossy Bog, receiving a flower delivery from Jeanie. Rough Waters is my 12th published novel, my 6th romantic suspense. He prayed she wouldn’t put it together. He needed more time to search for the stolen treasure. Time for a diversion. He gave her a moment to feel comfortable again, then leaned in, giving her room to escape, but she didn’t. She didn’t move a muscle as her warm coffee-laced breath feathered his face. The urge to kiss her fogged his brain. “I just bet you can,” he whispered, then closed the distance between them and nuzzled her neck. Her startled gasp of delight added fuel to his fire. He edged the rest of his body closer until they stood toe to toe, hip to hip. Her fingers gripped his, and her head dropped back. Oh, yeah. Her scent pulsed though him like a freighter bound for the coast. Jeanie dyes her hair pink as a personal statement to the world that she has Girl Power. If you decided to dye your hair a nontraditional color, what color would you choose? Why? 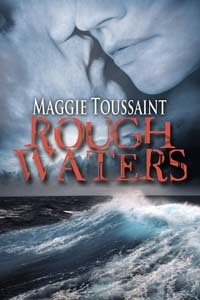 Leave a comment to be entered in the giveaway of a copy of Rough Waters, your choice of format. Giveaway ends 11:59pm EST Sep. 2nd. Please supply your email in the post. You may use spaces or full text for security. (ex. jsmith at gmail dot com) If you do not wish to supply your email, or have trouble posting, please email maureen@JustRomanticSuspense.com with a subject title of JRS GIVEAWAY to be entered in the current giveaway. Um . . I think I would go for blue! Don't know why - just fancy blue hair! Loved the excerpt and the excerpt on your website! Happy Release day! Hi Willa! Blue is a bold choice. Good for you! I would go for red. Strong radiant red. Thank you for the chance <3... and happy release day from me as well! You are certainly a lady who makes a statement! Love the idea of radiant red hair. Red is one of my favorite colors to wear, not because of its attention shouting, courageous color, but because its the most flattering with my light skin tone. But some days I'm not together enough to wear red clothes. Then I usually opt for peach or pink... Thanks for your comment. I had a hard time deciding about the color since I can't imagine ever changing my hair to a nontraditional color but I would go with pink also. I came up with this by deciding what color I would not want and that pretty much only left pink as a option for me. Thanks for the excerpt. Poor Jeanie. I have to find out what happens to her. I love that you selected pink, Jeanie's hair color. I can tell you a little more about Jeanie's inspiration. A close friend of mine fell to pieces after learning of her husband's adultery and abandonment. All of her friends rallied around, protecting her. She rallied in time, and even got a bit of her sassiness back, but, and this broke my heart, a piece of her wasn't there anymore. My eyes get all gooey thinking about it. If I could have snatched that man up by his heels and shook some sense into him, I would have, because even after he'd inflicted these deep wounds, she still loved him. I couldn't fix the reality of my friend's life, but a fictional character like Jeanie was clay in my hands. I found ways for her to fight back and regain her mojo. She came out of the experience wiser and stronger, and unwilling to settle for a loser. Whew. Sorry. I still have a lot of angst over my friend. I'll hush up now. I think I'd dye my hair blue. It's my favorite color, is a cool color as opposed to hot colors like orange and red, and is better suited to my personality. It also has a calming effect on people so that could be a plus as well. Thanks for the giveaway. I haven't read your work but now am intrigued so I will definitely be checking it out. I love your thought process in selecting blue. I am drawn to people who have calming effects because, much to my chagrin, I'm a fire sign. I thought I was easy going and a calmer, but I seem to have unlimited passion to champion my causes. But I think having strong emotions and understanding ourselves are both important. Like my character Jeanie, I strive to be true to myself. Those insights help me be a better writer, help me to question why my characters behave as they do. Motivation and conflict should be coupled together in an author's mind. I bet you would look stunning in blue hair! I knew someone who had dyed a wide streak of vibrant, nearly neon purple into her gleaming black bob, and it was absolutely stunning. I kept looking at it and admiring it from afar until I finally was able to speak to her. She said she wanted a change and she wanted something bold. Oh, I so wanted the courage to do that! But I chose another route of hair care and live vicariously through Jeanie, who is a strong woman despite her previous crumbling. So glad to meet up with you here. Great conflict, Maggie. I love it when you mix both an intense internal conflict with the suspense drama. Can't wait to read it. Thank you, Mona! Romance and suspense are two of my favorite reads, so it is almost a reward to be able to write stories like Rough Waters! If going to do something like that, might as well make it colorful. Steaks of pink and blue. I like your multi-colored approach. The world could always use more color, right? When I was 17, I used grape Kool-Aid to dye my hair. I thought it would come out a deep eggplant purple color, instead it was more of a lavender color. Why did I do it? Because I was tired of blending in with the crowd and I wanted to show people that I was a leader, not a follower. Oh,, Katherine! Thanks for the smile today. I love grape flavored anything, so your hair must have had a truly wonderful aroma. Good for you on standing out. It takes a lot of courage to be different. I'm learning that with my neon green sneakers. You wouldn't believe how many odd looks I get with them. Thanks for the comment, and for reading the blog about Rough Waters. Thanks for stopping by, and I think you'd look smashing in red, even a rusty red. I know blondes get lots of second looks, but redheads get longer first looks, or at least that's been my experience as an auburn colored hair person. It's difficult when our friends are hurting. I suspect we all have stories of friends and relatives who got the short end of the stick. We admire the ones that triumph, but there's something in most females that tends to coddle and protect the ones that can't regain their footing in good time. Trust me, fact is way stranger than fiction. Oh, most differently, bright RED, then I would be the brassy ole broad from Toddville!!! I love your books Maggie!!! Thanks for the huge compliment, home girl, and I'm sure you'd be quite the picture in Christmas Red hair! LOL! The only time I ever put coloring in my hair was for Halloween... if I did do it, I might choose a dark blue... or maybe a tame orange. Dark blue. Hmm. I'm thinking a rich indigo. That would be a brilliant choice. A tame orange, would that be a bit tangeriney? I could see that choice too, especially for Halloween. And with that color hair, you might not even need a flashlight for Trick or Treating ((grin))! I'd like deep auburn , but that is a traditional color. I'd have to go with blue because I'm old enough to be a "blue hair", or that shade of purple that Kelly Osbourne has. Isn't poetic that folks made fun of blue-haired old ladies for decades, and yet it is now popular for young people to have crayola crayon colors of hair? I missed the Emmys where, according to pundits on Google, Kelly O rocked the Emmys with her purple hair. It looked like a silvery lilac to me with shades of lavender. She looks so hip and modern. If I tried a "do" like that, it'd look like I got run over by a lawn mower. Hmm. I'd die mine purple with red and yellow streaks. Then all my favs would be covered. I admire people who have the guts to do things like that. I'd probably never do it, but who knows? You made me smile, what with mixing the colors of Easter and Christmas! You'd have very liturgical hair. And I'm sure you'd carry it well. Thanks for reading my post about my new release, Rough Waters! Black with deep purple streaks - matches a favorite outfit. I should've guessed someone with a strong blogger name would pick such strong colors. Heck all this talk about colored hair and I might just give it a go. Thanks for reading the post about Rock and Jeanie's story. I see we're adding you to the purple line, LOL! I'm sure you will look smashing! If you ever do go bold like this, I hope you'll think of Jeanie and her pink hair. Second try to post a comment. Rough Waters sounds like a winner! Great plot and fascinating characters. Thanks for posting. I'm sorry that you had difficulty posting a comment, but I'm pleased to report this one went through just fine. Thanks for your kind words about Rough Waters. I love electric blue and lime green together, and they're pretty darn cool individually too. I can definitely see those colors as "highlights" in a head of hair. And I hear you about work disapproval. Adhering to a professional dress code is really limiting in terms of self-expression. But the money is nice. Oh well, thanks for playing along and emulating my heroine, Jeanie with the pink hair. I'd have to go purple. Love that color. Hey Mary, I think purple may be winning the hair color wish list here. It's hard not to smile when you see purple. It has the nicest luster, I think. Thanks for your comment. I hope you will check out Jeanie and Rock's story, Rough Waters. I'd go with blue! Deep blue. It would be so fun! Anonymous, You wouldn't be anonymous if you went with deep blue! You would definitely be making a statement and stand out from the crowd! LOL! In my lifetime I have had every color hair except black! I have had streaks of pink, green and blue. I have a friend who gives her poodle's top knot the same spray in color streaks that she has. Now THAT may be going too far. Love to win a copy of your book. I love adventurous heroines. Hiya Trish J, It sounds like you have a lot in common, hair-wise, with my heroine, Jeanie. I love that you are so self-assured and courageous in your choices. Hi Everyone! My guest host time here at Just Romantic Suspense is drawing to a close. The entry pool for the giveaway of Muddy Waters, the first book in this series, closes at midnight Eastern time tonight. I will randomly select a name from those who have provided their email addresses with their comments. And while I have your ear, I'm running a $0.99 sale on Hot Water, book 2 of this series at Amazon, Kobo, Bookstrand, All Romance Ebooks, and The Wild Rose Press. It was so much fun reading these comments. What a diverse group. I love the colors aqua and periwinkle and find them very calming. So I'd alternate weeks so my hair would match my wardrobe!